With September right around the corner, the New York Yankees may finally be starting to get healthy. Friday, the team activated second baseman Starlin Castro. 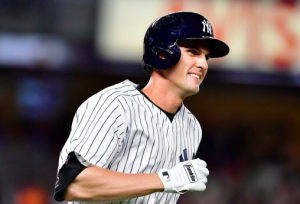 On Saturday, first baseman Greg Bird was activated after a long stint on the DL. Tyler Austin was optioned to triple-A to make room for Bird. After sitting out all of 2016 after labrum surgery, it’s been another injury-plagued season for Bird. He missed most of May with a bruised ankle and was put on the DL for the same injury at the end of June. After suffering a setback that required surgery in July, many doubted whether Bird would be able to rejoin the Yankees before the season. But Bird remained confident that he’d be back, and here he is with more than a month left in the regular season. “We think he looks really good, and let’s just wait and see what happens (Saturday),” manager Joe Girardi said of Bird’s return. Despite getting so few at-bats over the past two seasons, Bird has been swinging a hot bat during his most recent minor league rehab assignment. In nine games at triple-A this month, Bird is hitting .423 with three home runs and two doubles, posting an OPS of 1.330. That has given the Yankees some level of optimism that he’ll be able to produce upon his return to the majors. Of course, early in the season, Bird had all kinds of trouble. In 60 at-bats at the big league level this year, Bird has just six hits, striking out 22 times. However, the Yankees are going to give him a chance to see if he can provide a spark for them down the stretch. With Bird back, the Yankees will have to shuffle a few pieces around the infield. Chase Headley has seen most of the action at first base since the team acquired Todd Frazier at the end of July. Both Bird and Headley are at their best against right-handed pitching, so who mans first base against lefties is uncertain. Girardi has also indicated that Headley will also see some time at third base in place of Frazier. Of course, performance is likely going to dictate playing time heading down the stretch. The Yankees are still hoping to catch the Red Sox atop the AL East. They currently trail Boston by 4.5 games. At the same time, the Yankees hold a 2.5-game lead for the top wild-card spot. The Yankees would prefer to keep a comfortable lead for the top wild-card spot rather than being drawn into the parade of teams fighting for the second wild-card spot. After all of his injury issues the past two seasons, there’s no guarantee that Bird will be able to translate his recent success in the minors to a pennant race. But he does provide the Yankees with another option at first base and a potential difference maker. The Yankees will be glad to have him back from the DL and see if he’s able to help them reach the postseason.